Pathologic Q waves are a sign of previous myocardial infarction. They are the result of absence of electrical activity. A myocardial infarction can be thought of as an elecrical 'hole' as scar tissue is electrically dead and therefore results in pathologic Q waves. 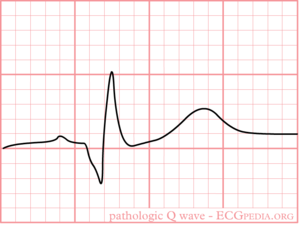 Pathologic Q waves are not an early sign of myocardial infarction, but generally take several hours to days to develop. Once pathologic Q waves have developed they rarely go away. However, if the myocardial infarction is reperfused early (e.g. as a result of percutaneous coronary intervention) stunned myocardial tissue can recover and pathologic Q waves disappear. In all other situations they usually persist indefinitely. The precise criteria for pathologic Q waves have been debated. Here we present the latest definition as accepted by the ESC and ACC. Absence of pathologic Q waves does not exclude a myocardial infarction! For those interested: the Minnesota Code Classification System for Electrocardiographic Findings contains a very extensive definition of pathologic Q waves. This page was last edited on 8 January 2012, at 22:10.